Erasmus+ in AdminProject – online! There’s been some time since our last post. Mainly because most of the changes and fixes aren’t really much visible to end-users. There is one thought that has surfaced just now and it streamlines the Timesheet export function Before, you had to export the timesheets for each month separately. 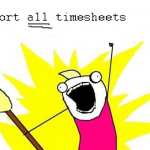 Now, you can export all timesheets for a given staff member, or only those you need on a single document, with just a few clicks.